By Srinivas Chowdary Sunkara // petrobazaar // 30th March, 2019. Fuel Oil prices in Singapore market are edged down by $11 or 2.3% since the 14th March, 2019. 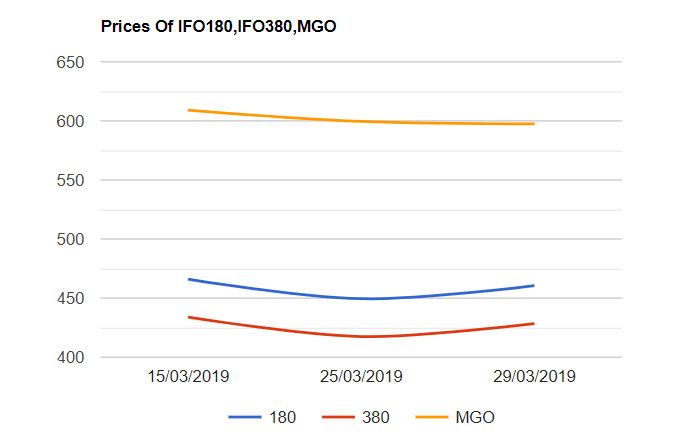 Both the fuel oil 180 cSt and 380 cSt grades were traded down to settle at $460.5 and $428.5 respectively yesterday while MGO prices were settled down by $12 at $597.5. Following the global trend, Industrial fuel oil prices in India are very likely to slip from 1st April, 2019.Bunker fuel prices were gained $79 or around 20% during the first quarter of 2019 in line with crude prices. Turning to product market, IMO 2020 brings cheer to product tanker and product market. Sourcing of VLSFO to comply IMO 2020 regulation is a challenge to shippers and it needs to be replaced by an expensive fuel, gas oil. The increase in demand for gas oil will require higher refinery runs, which should be positive to refinery industry. Good day.